Years of accumulation has left me with a haphazard collection of networked computers at home, from a (still fully working) 2002 Iyonix through to the ultrabook used as my daily development machine. 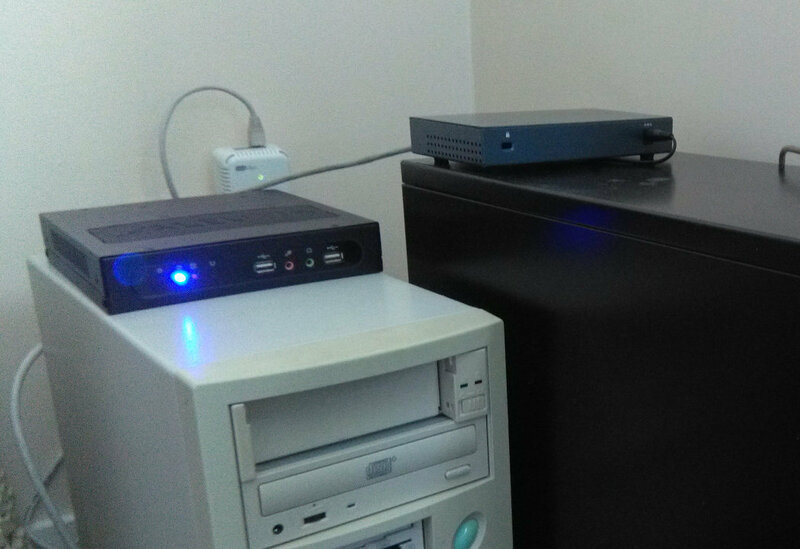 There are six serious machines connected to the network, if you don't count the penumbra of occasional and IoT devices (smart TV, playstation, Raspberry Pis, retired laptops, A9). All of this is ably managed by Constantia, my home server. As it explains on her webpage, Constantia's a small 9 Watt fanless server I bought in 2011, designed to be powered using solar panels in places like Africa with more sun than infrastructure (and not in a Transcendence kind of way). Although Constantia's been doing a phenomenal job, until recently she was stuck running Ubuntu 12.04 LTS Precise Pangolin. Since there's no fancy graphics card and 12.04 was the last version of Ubuntu to support Unity 2D, I've been reticent to upgrade. A previous upgrade from 8.04 to 10.04 many years ago - when Constantia inhabited a different body - caused me a lot of display trouble, so she has form in this regard. Precise is due to fall out of support next year, and I'd already started having to bolt on a myriad PPAs to keep all the services pumped up to the latest versions. So during my summer break I decided to allocate some time to performing the upgrade, giving me the scope to fix any problems that might arise in the process. This journey, which started on 19th September, finished today, a full two weeks later. As expected, the biggest issue was Unity, although the surprise was that it ran at all. Unity has a software graphics-rendering fallback using LLVMPipe, which was actually bearable to use, at least for the small amount of configuration needed to get a replacement desktop environment up and running. 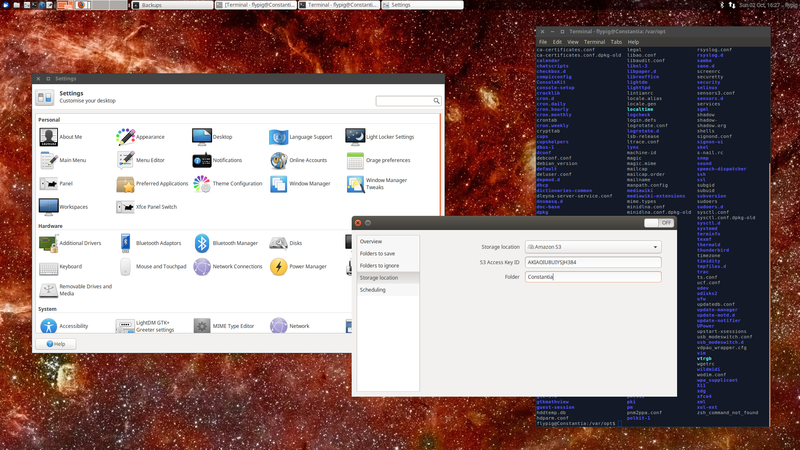 After some research comparing XFCE, LXDE and Gnome classic (the official fallback option) I decided to go for XFCE: lightweight but also mature and likely to be supported for the foreseeable future. Having been running it for a couple of weeks, I'm impressed by how polished it is, although it's not quite up there with Unity in terms of tight integration. There were also problems with some of the cloud services I have installed. MediaWiki has evaporated, but I was hardly using it anyway. The PPA-cruft needed to support ownCloud, which I use a lot, has been building up all over the place. Happily these have now been stripped back to the standard repos, which makes me feel much more comfortable. Gitolite, bind, SVN and the rest all transferred with only minor incident. The biggest and most exciting change is that I've switched my server backups from USB external storage to Amazon AWS S3 (client-side encrypted, of course). Following a couple of excellent tutorials on configuring deja-dup to use S3 by Juan Domenech, and on S3 IAM permissions by Max Goodman, got things up and running. But even with these great tutorials, it was a bit of a nail-bighting experience. My first attempt to back things up took five days continuous uploading to reach less than 50% before I decided to reconfigure. I've now got it down to a full backup in four days. By the end of it, I feared I might have to re-mortgage to pay the Amazon fees. So, how much does it cost to upload and store 46 GiB? As it turns out, not so much: $1.06. I'm willing to pay that each month for effective off-site backup. The upgrade of Constantia also triggered some other life-refactoring, including the moving of my software from SourceForge to GitLab, but that's a story for another time. After all this, the good news is that Constantia is now fully operational an up-to-date with Ubuntu 16.04 LTS Xenial Xerus. This should get her all the way through to 2021. Kudos to the folks at Aleutia for creating a machine up to the task, and to Ubuntu for the unexpectedly smooth upgrade process. The bad news is that nextCloud is now waxing as ownCloud wanes. It doesn't seem to yet be the right time to switch, but that time is approaching rapidly. At that point, I'll need another holiday.